This is a custom built cable assembly, made by WORLDS BEST CABLES (WBC). 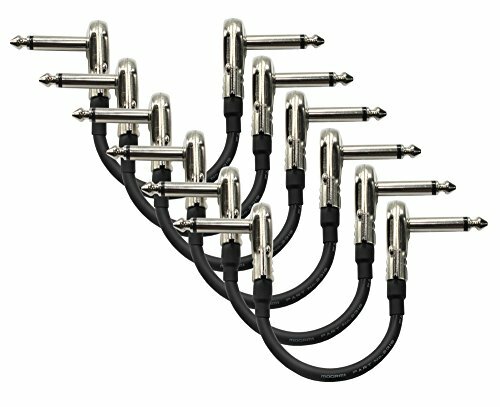 This cable assembly is made using the Mogami 2319 wire and Eminence Premium Nickel Plated 1/4 Inch right-angled, low profile Pancake type Connectors. We at WBC always make world-class custom-built cable assemblies using many of the leading cable and connector brands, if you are unable to find the length and type of cable you are looking for, please feel free to contact us, we will strive to assemble the required cable for you. IMPORTANT, PLEASE NOTE: The cable length is measured from TIP to TIP of each connector, this is the industry standard for measuring patch cables (the measurement details are clearly depicted in one of the images in the image gallery to further clarify the measurement process. There are many images in the gallery, please click on the main image to open the full gallery). Please also check out the connector dimensions as some connectors might be too wide for jacks that are spaced close together. This is a custom built cable assembly, by WORLDS BEST CABLES (WBC). This cable assembly is made using the Mogami 2319 wire and Eminence Premium Nickel Plated 1/4 Inch right-angled, low profile Pancake type Connectors. We at WBC always make world-class custom-built cable assemblies using many of the leading cable and connector brands, if you are unable to find the length and type of cable you are looking for, please feel free to contact us, we will strive to assemble the required cable for you. The brand of wire we used for this custom cable assembly: Mogami, one of the most sought after Pro cable brands, preferred by major recording studios and leading sound engineers around the world. All Mogami cables are made in Nagano - Japan using the best materials and technological expertise of decades of R&D. All our bespoke cables are professionally soldered using WORLDS BEST CABLES proprietary 4% silver solder blend & a nitrogen-assisted soldering process unique to us, exceeding industry standards, improves integrity of solder joints over traditional methods. These are custom made cables lovingly assembled by WORLDS BEST CABLES, we offer the largest array of custom built cables in the market, we carry all the major cable and connector brands. We have served millions of customers with quality assemblies for many years - This sale is for 6 patch cables (6 units), each cable is 6 inches long. Cable length is measured from TIP to TIP as depicted in the images in this listing (please refer to the image gallery). If you have any questions about this product by WORLDS BEST CABLES, contact us by completing and submitting the form below. If you are looking for a specif part number, please include it with your message.